Collect the stool in a dry, clean, leakproof container. Make sure no urine, water, soil or other material gets in the container. 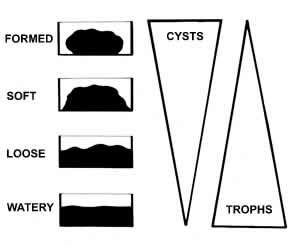 The image on the right demonstrates the distribution of protozoa in relation to stool consistency and should be taken into consideration when specimens are received. Fresh stool should be examined, processed, or preserved immediately. An exception is specimens kept under refrigeration when preservatives are not available; these specimens are suitable for antigen testing only. Preserve the specimen as soon as possible. If using a commercial collection kit, follow the kit’s instructions. If kits are not available, the specimen should be divided and stored in two different preservatives, 10% formalin and PVA (polyvinyl-alcohol), using suitable containers. Add one volume of the stool specimen to three volumes of the preservative. Insure that the specimen is mixed well with the preservative. Formed stool needs to be well broken up. Insure that the specimen containers are sealed well. Reinforce with parafilm or other suitable material. Insert the container in a plastic bag. Certain drugs and compounds will render the stool specimens unsatisfactory for examination. The specimens should be collected before these substances are administered, or collection must be delayed until after the effects have passed. Such substances include: antacids, kaolin, mineral oil and other oily materials, non-absorbable antidiarrheal preparations, barium or bismuth (7-10 days needed for clearance of effects), antimicrobial agents (2-3 weeks), and gallbladder dyes (3 weeks). Specimen collection may need to be repeated if the first examination is negative. If possible, three specimens passed at intervals of 2-3 days should be examined. Preservation of specimens is necessary when stool specimens cannot be examined within the prescribed time interval. Various preservatives are available (see table), with the two most commonly used being 10% aqueous formalin and PVA (polyvinyl-alcohol). If molecular detection (PCR) is required, refer to the molecular diagnosis section to obtain specific information on how to collect, preserve, and ship the specimens. Because 10% formalin and PVA have complementary advantages (see table), it is recommended that the specimen be divided and preserved in both types of preservatives (add one volume of stool to three volumes of the preservative). Commercial two-vials kits are available for this purpose. Preserved specimens can be stored for several months. For additional information on stool collection, call the Division of Parasitic Diseases at (404) 718-4110.